The following is a reprint from my friend Julia Tomiak’s blog, Diary of a Word Nerd. I thought it had great ideas so I asked if I could share it with you. Julia kindly agreed. I hope you enjoy it. I’m in the “shuttle years” of parenthood- meaning, I spend an inordinate amount of time in the minivan delivering children to various activities. To keep my brain stimulated while adding miles to the Odyssey, I listen to podcasts. They’re also great for road trips. Since summer is the season of travel, I’d like to share my favorites with you. 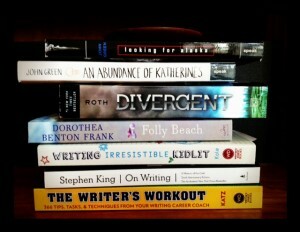 Some emphasize “words” and include book reviews, writing tips, and bookish news. Others focus on “nerdiness”, with conversations about responsible use of technology and thoughtful commentary on life in general. Books on the Nightstand Ann Kingman and Michael Kindness work in the publishing industry and share their thoughts on all things books. They recommend great reads and discuss things like “Why do some people like dark books?” and “Favorite books within books”. For summer, they are running a Book Bingo game that challenges listeners to read a variety of books. A must for all book lovers! Helping Writers Become Authors K.M. Weiland is a published author who shares her expertise on writing. Tune in to learn about character development, outlining, or common writing mistakes. Last year she ran an excellent series on character arc that helped me with my novel revision. The Narrative Breakdown Cheryl Klein is an editor who likes kid lit, among other genres, and James Monahan works in film. Together, they analyze topics like story structure and what makes a good character flaw. I’ve enjoyed many episodes, including interviews with YA authors Rainbow Rowell and E. Lockhart. Grammar Girl Mignon Fogarty packages her quick and dirty grammar tips into podcasts of 15 minutes or less. Sometimes she goes into extensive detail about word origins and the rules of grammar, more than my brain can handle in between soccer training and art class. But still, she has taught me a lot, especially a humble respect for the changing nature of language and the need to foster an attitude of open mindedness instead of prescriptivism. Writing Excuses This podcast, hosted by a team of published authors including Brandon Sanderson, usually runs fifteen minutes. With humor and brevity, the hosts tackle important writing principles. Best of all, they encourage you to stop making excuses and start writing. Note To Self (formerly New Tech City) Manoush Zomorodi explores the impact of technology on our lives and helps listeners find balance in the digital age. I especially like listening to this one with the kids in the van; it sparks interesting discussion. Episode topics include how much screen time is appropriate for kids, talking to teens about tech, and the importance of spending time away from your phone to foster creativity. I’m not a huge tech geek, but I want to use technology in a thoughtful way, and Note To Self helps me do that. 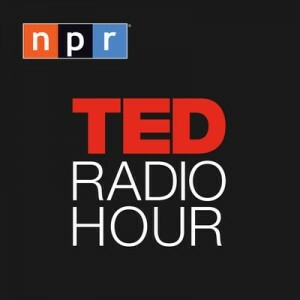 The TED Radio Hour (Do you know what TED stands for? Technology, Entertainment, Design) In each episode, Guy Raz takes snippets from several TED talks and lumps them under one topic. For example, in “Framing the Story”, he included talks by a movie producer, an author, and a book cover designer. The variety of speakers keeps the episodes interesting and inspiring. I like listening to the TED Radio Hour while I run. The Portfolio Life Author Jeff Goins believes that you don’t have to do just one thing with your life, but you should love what you do. He says it’s okay to be a mother and a writer and a photographer and a fitness expert. This concept of “A Portfolio Life” validates my existence. Jeff offers helpful tips for managing time and fostering creativity. You must schedule the important things so they don’t get crowded out by the urgent things. 5. Wait, Wait Don’t Tell Me Peter Sagal hosts this hilarious news quiz, my go-to podcast when I’m feeling sleepy on long car trips. I get to laugh and review current events at the same time! Note: this one isn’t always appropriate for the kids. 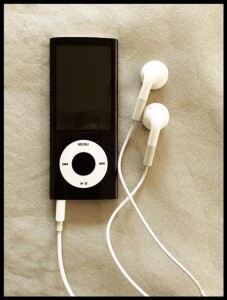 This entry was posted in Podcasts and tagged Podcasts for readers, Podcasts for Writers. Bookmark the permalink. Thanks Carol for sharing my post! I hope your readers find it helpful! BBC podcast in which 3 university professors talk to host about a topic. Very wide-ranging. Covers everything from the Black Death to Black Holes. Dan Carlin’s exceptional, but all too infrequent history podcast. Kevin Stroud with another exceptional podcast. Some people complain that he repeats things too often, but with a brain like mine, I need all the repetition I can get. Thanks so much for your suggestions! I will check them out.